Your kids seem to take over your home regardless of what room is actually theirs! 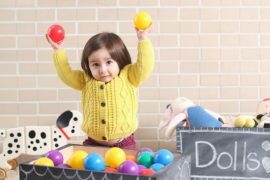 Their toys, belongings, schoolwork and recreational diddles can create chaos in your home and creative toy storage is essential. Before you can start, you will have to remove the old and make way for a system that will help you and your kids. 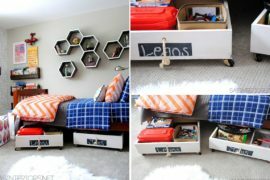 If you have been thinking of revamping your kids’ room, here are tips that will help and inspire them to want to clean up and stay organized! 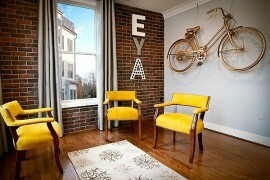 Most homes have a level of collecting items that is not needed. 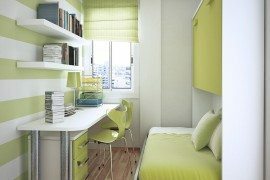 Whether it’s in the adult or child spaces of your home, either way, purging, sorting and tossing are the three ways to make room for new organization and free up hidden storage space. If your child is old enough, go through and purge or determine what they have outgrown, what can be donated or is broken and should be thrown away. For items that will be kept, sort toys and personal belongings into piles so you can evaluate them separately. This process will help create a clean room of space and possibilities for organizational options. Children love color and adults do too for that matter! When bringing in new organization, ensure that color, patterns, textures and other visually appealing design elements are part of the organization system. 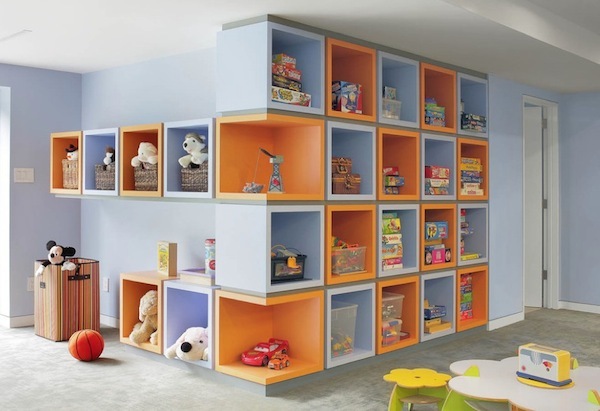 Built-ins or custom wall units are a favorite of many parents because they don’t take up a lot of space and they can be painted to match the interiors of your child’s room or playroom. Use color to help them organize. 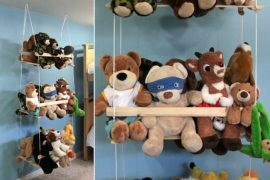 Different color shelves can help them sort toys by size, shape, or even just display their favorite stuffed animals without them consuming their bed or floor space. 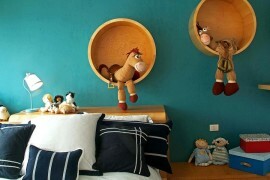 While your kids’ room is important, remember they live throughout your home! 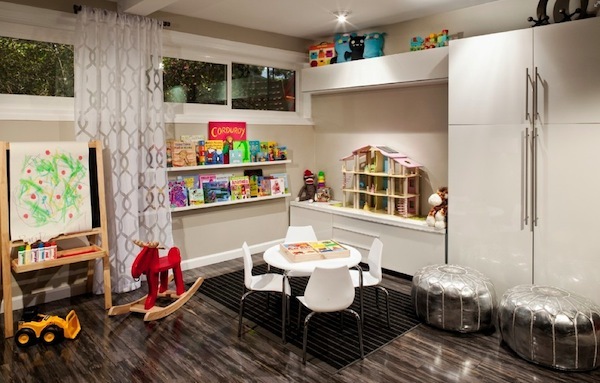 Ensure your other rooms in your home have options for their toys too. Beautiful furniture options for your living and family room can store children’s toys with a sophisticated flair, without looking too juvenile or ruining the design aesthetic of your space. Look to creative credenzas, bookshelves, and coffee tables with drawers and storage to keep all of their toys safely tucked away until they want to play. Using your adult furniture to sort and store their toys will also help them realize that the entire family has to share a space, instead of the entire house being only for them. If you thought there was no possible way that you could peacefully share a home with your kids’ toys and belongings, the challenge just became a little easier. From sorting and purging to choosing colorful organization methods, your home can still look fabulous while helping your kids love every inch of your home. Finally, don’t feel as though you have to give up your grown-up style to house their toys, gorgeous storage furniture will keep the whole family happy and well organized.